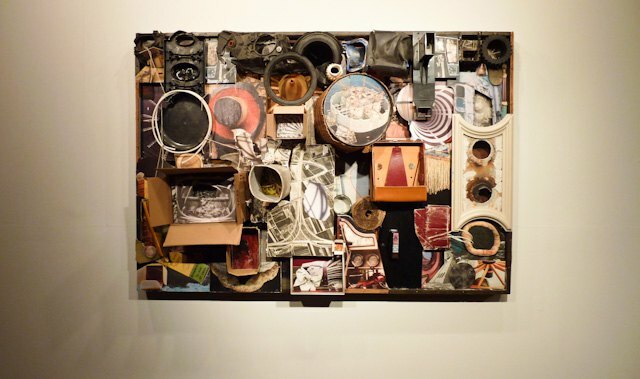 When Robert Rauschenberg set out to create his famed collages and assemblage pieces comprised of found objects, he created sculptures of the stuff of his lifetime. They were a living time capsule of sorts, discarded evidence of life as someone once knew it in the '40s and '50s. 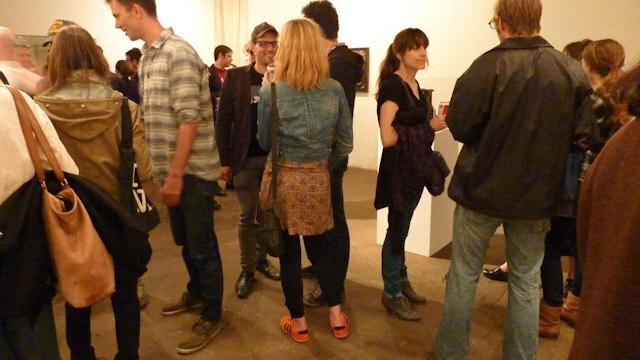 Perhaps taking a cue from this, Andrew Hurst takes a similar 3D snapshot of life at this time at his current show at English Kills Gallery. It’s easy to look back and reflect, and think ahead and dream, but capturing the moment, the feeling of nowness, is no easy feat. Upon entering English Kills gallery, the viewer feels like a fly swirling around the junk yard of life (an actual fly was spotted upon arrival). 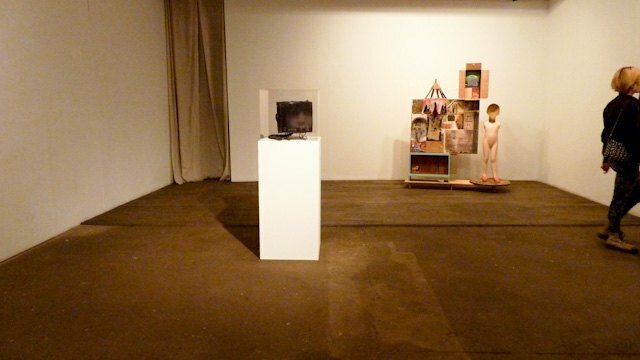 Pop-out pieces are scattered around the gallery, hung on walls, broken glass, dirty metal and twisted wires where paintings and drawings usually hang - dark, dirty, and seemingly morose. Cutouts of magazines and images of snakes and other seemingly discarded memories appear to be part of a sculptural scrapbook. The pieces evoke both a cheerful and somber tone. 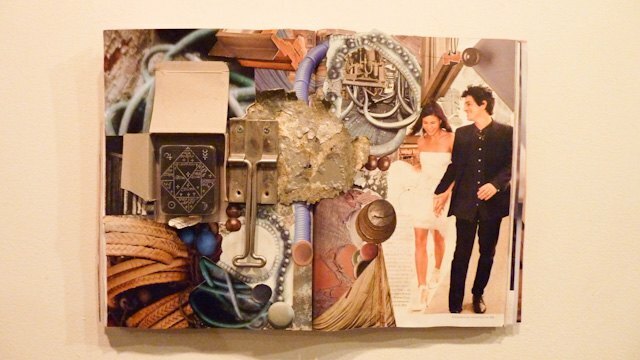 Some works seem to joyful contain images of weddings and happy moments, like in the piece titled Magazine in which an actual magazine with this image is also filled with scraps and metal. Others seem haunting, a reminder of what our discarded things may say about us. 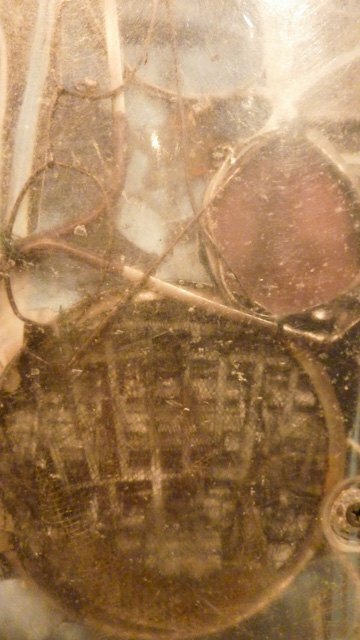 A work titled SYD TV, for example, appears to be a small broken old school tv, one that you might take with you to your college dorm or a campsite. A thick, spiral cord sprawls out the back, as if ripped from whatever socket once gave it life. The image on the screen is a faint whisper of a man's face, the eyes and nose just barely visible as they peek through a foggy faded screen. After seeing the look in his eyes, one wonders if this box is the host to his life, perhaps the cord feeds him life, acting as a sort of spine or brain stem. 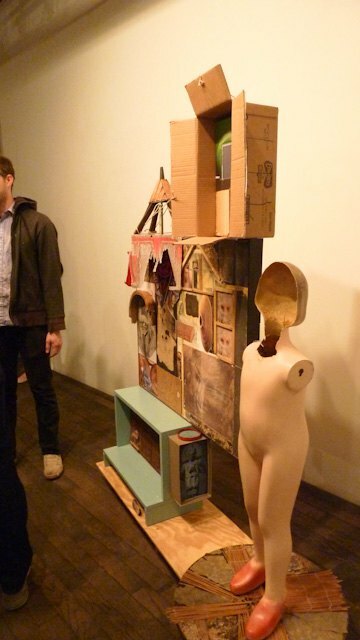 It is hard not to look at Hurst’s works and make the connection to Rauschenberg, but in the context of today, it takes on a totally original meaning. It’s interesting to think of the idea of being “plugged into” a TV in the '50s, and what it means to have a brain stem connected to media today. An image of a magazine or a pay phone has different meaning in today’s world of ephemeral media, of the disregard for physical objects as services and material moves onto the web. To behold the physical scrapbook style of Hurst’s pieces in the show is a refreshing experience. To look at an object and the way he juxtaposes materials of different subject matter gives objects normally deemed as shallow (phones, TVs, magazines) a whole new way of communicating with his audience. 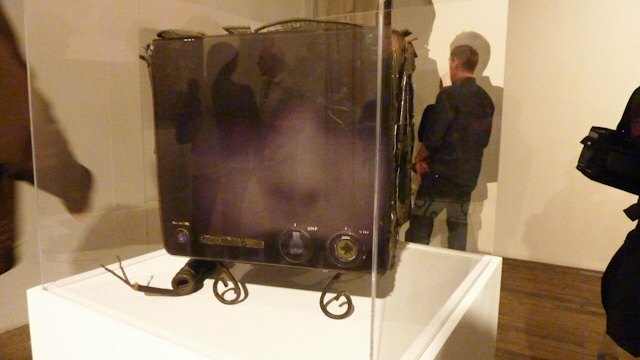 A favorite piece in the show is one you can’t see, but is perhaps the most important. A part of the show that makes each piece pop, makes each piece attention grabbing, makes each piece important: 2012, the current time and place and all that it encompasses.